Richard Browning, Founder and Test Pilot, Gravity industries, introduces special guests to 1000bhp of Gravity Jet Suit. Gravity is a British human propulsion technology start-up. Our mission is to re-imagine the future of manned flight. The Jet Suite has six miniature jet engines mounted on the arms and the lower back. the specially designed exoskeleton allows for vertical takeoff and flight, and can go as high and as fast as you like thanks to its 1,000-horsepower. 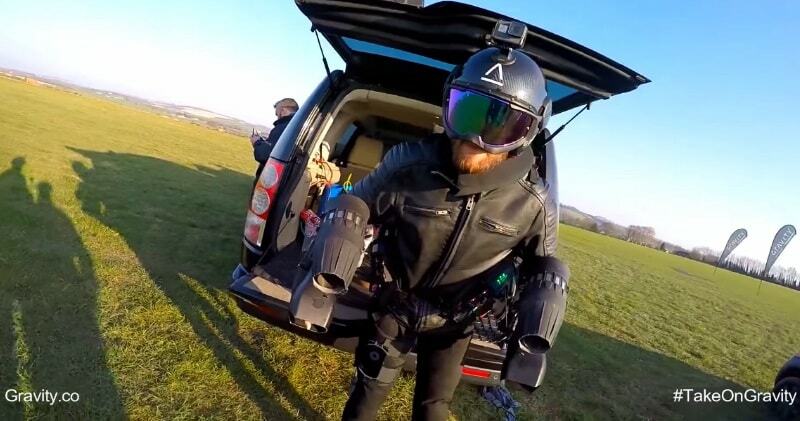 Having already achieved a speed of 32.02 mph (51.53 km/h) work has now started on a safety device that could allow the wearer of the suit to travel at around 100 mph. The flight suit features six kerosene-fuelled micro gas turbines, each of which has 22 kg of thrust and has an output of 1,000 horsepower.It’s controlled through body movements alone.